Your guide to entertainment, humor, Real Estate, investment, finance, and careers in Pea City, fish, Tongue Meat and all of Landsfill County! 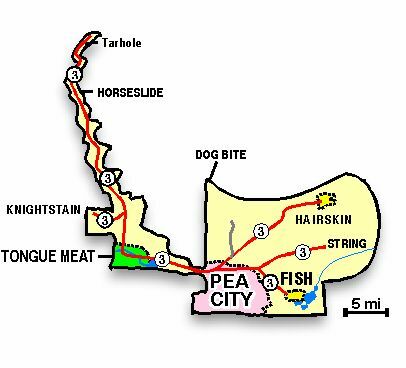 Pea City, Fish or Tongue Meat! OPPORTUNITY AWAITS in the Pea City, Fish, Tongue Meat area! Where low wages mean low prices for you! Lowest cost of living anywhere. WITH THE HIGHEST RATE of liver disease in the nation, the Triangle area offers opportunities in the fields of Medicine, Toxic Waist Management, and Class Action Litigation. EXCITING CAREERS in the Potted Meat or the Petroleum Based Ointment industries await the upwardly mobile job seeker, while the discriminating retiree might enjoy the luxurious community of Tongue Meat, once the only tongue meat cannery town in the country, now home of Tongue Brook Country Club, featuring a challenging 9 hole golf course, detox center, tennis court and lounge. YES, its all here in Landsfill County! Click below for more info about jobs, events, and life in the Pea City, Fish, Tongue Meat area. Bookmark this page so that you can return for all the late breaking news from the Pea City, Fish and Tongue Meat communities. A native of landsfill county, Vance has lived from Hairskin to Tarhole and now resides in Fish. Vance attended Pea High his sophomore and junior years, and was an easy choice for the Pea City Web writer because he is not insane due to syphilis and has his own transportation. Be sure to click through the entire website for Pea City & Landsfill County - Your guide to entertainment, humor, Real Estate, investment, finance, and careers in Pea City, fish, Tongue Meat and all of Landsfill County! Names and nick-names for this website may include: Peacity, PEACITY, peacity, Pea City, pcity, and not pee city.